André Café in the Press! A baby grand piano, a shelf full of books, Christmas tree lights, New Orleans food and live classical music by a living composer. Life is good - at least for a few hours - at the André Café Acoustique in blighted downtown Chester, amid what could be viewed as a whisper of an urban comeback. 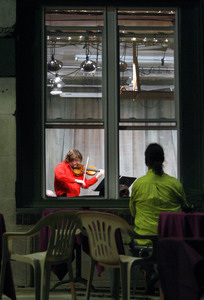 The occasion was a benefit concert for the cafe, in its capacity as the Chester Performing Arts Project, by violinist Kurt Nikkanen and composer/pianist Steven Gerber, who drove several hours from New York. "An unusual and wonderful space" was Gerber's assessment of the cafe, decorated with paintings and photos by area artists. Approaching the corner of Edgmont Avenue and Fifth Street in Chester, the usual urban rhythms are markedly different, if only because they're faint. Friday-night street traffic is eerily scant in this city where the population has dropped by half since 1950. André Café Acoustique is a bright haven for the arts in Chester, a city with a generally gloomy outlook. 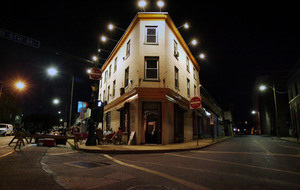 The cafe was opened three years ago by jazz pianist Paul Fejko. 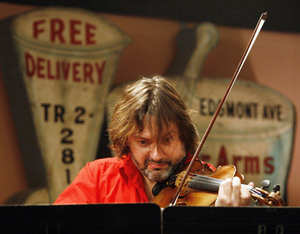 Violinist Kurt Nikkanen , who has played concerts around the world, joined in the benefit for the cafe. Near the cafe's outdoor tables, sidewalk vendors quietly sell gold chains and artificial flowers. Because it's summer, all the cafe's windows are open; sounds of street basketball and smells of passing cigar smoke waft in. From the cafe's loudspeakers, the music wafts out. T-shirt. "I'm very much of the philosophy that if you build it, they'll come." And they did on this recent night - 15 or so from Haddonfield, Philadelphia and Swarthmore. Jazz concerts, like the July 20 appearance of the sextet Infinity, are likely to be packed (the place will hold about four dozen); tonight, classical music has mainly attracted Fejko admirers from Gloria Dei (Old Swedes') Church in Philadelphia, where he's resident organist. But the program was one that those in the know would consider worth the drive. Nikkanen's excellent Bartok recordings, concerts around the world with composer John Adams, and solo work with the New York City Ballet make the prospect of hearing him play Bach's Sonata for Unaccompanied Violin in G minor in a club setting appetizing. 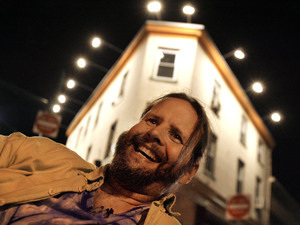 Gerber, who has collaborated for years with Nikkanen in recordings, responded to the freewheeling atmosphere with his own witty take on cocktail piano music as well as fantasies on Greek folk songs. It was a heady, sophisticated concert, ending with what was probably the Chester premiere of Arvo Part's prayer-like Fratres. The concert had two-way missions. Classical music has been a starting point for urban renewal in communities from Newark, N.J., to Camden thanks to its loyal, moneyed audience; like many musicians, Gerber is keen to support Fejko's new-music sympathies, which have been part of his many musical incarnations in and around Philadelphia. The cafe, in return, was out to make audiences feel warmly welcome during the 40-minute intermission. Congenial and poised, cafe managing director Donald Newton announced he'd picked tomatoes from his garden that day and created a salad to serve alongside Creole dishes from L' Essence de New Orleans, a restaurant opened up the street by Hurricane Katrina refugees. One of the town's assemblymen chatted outside. How far Chester has to go is suggested by contrasts with relics of what it was: the majestic, WPA-era post office building down Edgmont Avenue, still bearing a "fallout shelter" placard from decades past, or the charmingly retro sign - "Chester Arms Pharmacy, Free Delivery" - that framed Fejko's building in the years before the shipbuilding industry declined and took the town with it. The city virtually gave the building to Fejko in 2002; it had simply been abandoned, and, thanks to broken windows, was only accumulating pigeon droppings. Fejko's plan was to create as many as six performing arts spaces in the town, in hopes of forming the sort of artists' nucleus that has revitalized numerous urban neighborhoods, among them Philadelphia's Northern Liberties and Old City. That larger plan appears to be dead in the water for lack of money, he said. But in the meantime, "I've had a Swedish folk fiddler in here. I've had a theater group. . . ."